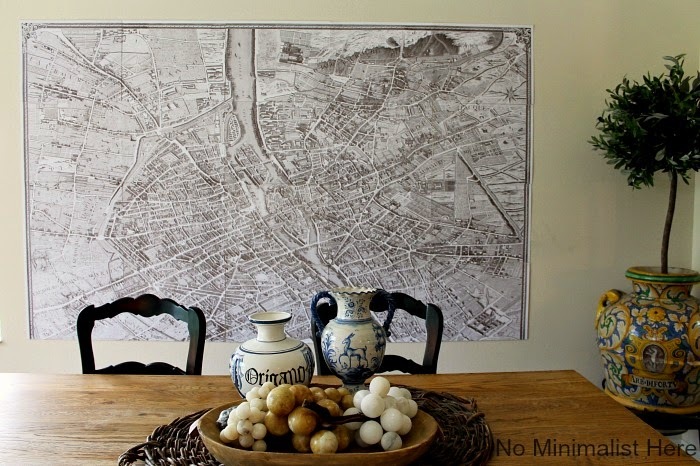 I recently asked my readers should I add the large map of Paris or instead use board and batten in the dining room. The results are in and the majority said go with the map. I was a little nervous about adding something as big as the map so I temporarily taped it to the wall. There is actually one more row to be added to the bottom but I ran out of tape! I really do value your opinion… so what do you think? Yah or Nah? If you missed the Spring Blog Hop you can see our courtyard decorated for Spring and a list of all the participants in the blog hop Here. 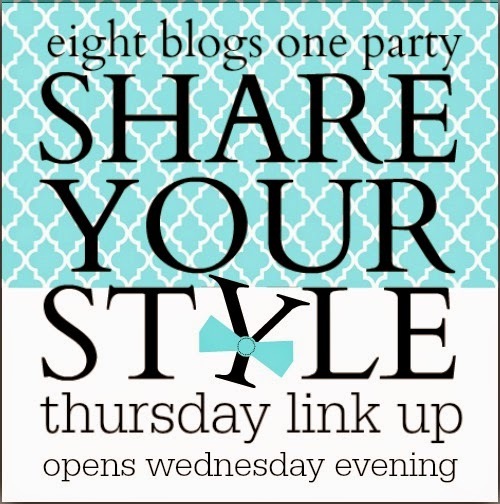 Please join myself and the other seven host for the Share Your Style link party starting Wednesday evenings. Thanks for visiting and I look forward to hearing your thoughts on the Paris map. Love your map. It looks fabulous. i didn't vote, but i would rather see board and batten with the rest of your wonderful decorating. OMG I KNEW it would look perfect Sherry and it absolutely does – what a beautiful wall statement !!! Wow, it's stunning. I love it! Sherry I'm loving that map! Love how it fills in most of the wall! Your floors look fabulous! Yes! But since there is one more row on the bottom, I would start a bit higher. Love it! I love the map! It adds visual interest and it is a great conversation starter. I like it! I think it needs a frame though. It would be nice to frame it in a wood tone that matches the chairs. I love the map. 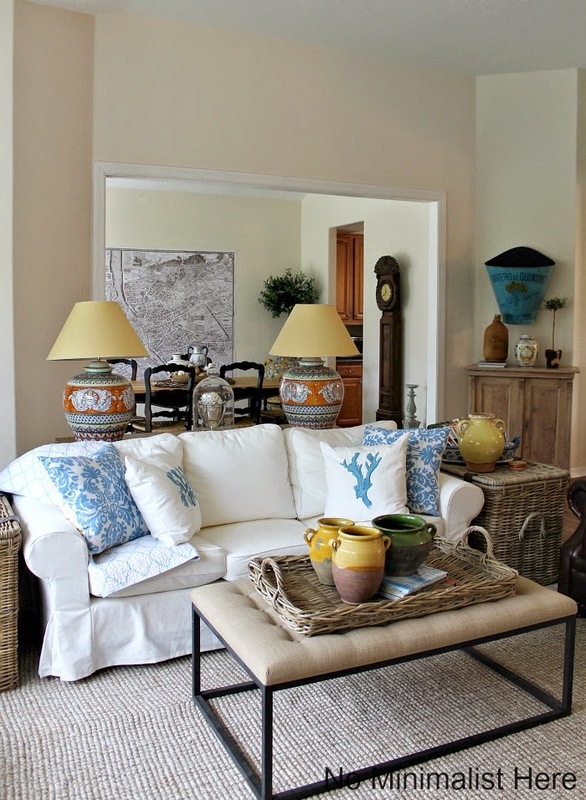 Have you considered centering the map on the wall between the window and corner of the room? Even if the tree sits in front of part of the map, I think it would look good. Its way too dominating, but you have to love it to live with it!! I love it, but I love maps and I love Paris. I think it looks great. Absolutely, positively, YES! The map is bold and interesting. The paneling would just be there. Drastic changes require an adjustment period. It really draws your eye through the rooms, I love it! Sherry, I love the impact of the large map. I'm just wondering if it needs to be moved to the right some and framed with small trim. Are you going to add drapes later to that window I see? The map will need to move over for those. It just looks too close to the window, but I'm not standing in the room. I absolutely love the map! 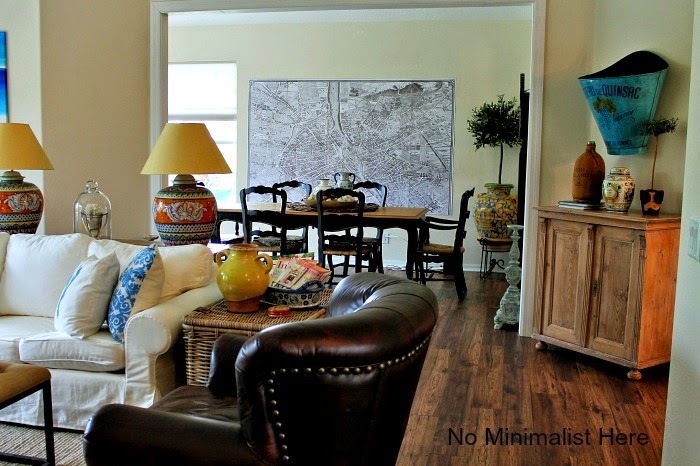 Everyone is going with board and batten so the map is unique and looks great in your dining room. I love the map. Perfect on the wall. Hi Kim, I originally planned to just tape a few pieces of the map so I didn't measure. It will be raised level with the top of the window and centered on the wall. I am shopping for trim today and window treatments. I appreciate everyone visiting and taking the time to comment. Just darling…. think I'll do the same with an old map I have of Mobile Bay and the swamp area surrounding…full of islands, etc… THANKS! Have always been a fan of enlarged maps on walls, but looks quite large in your space…BUT, why not consider cutting your map into equal sections, (ie.10×14 or 12×16), and framing each section, without a matt, all sections with identical frames, and hanging each framed section on your wall "gallery style", so you still have your entire map, just hung in sections instead of one large single piece of paper? Does that make sense?? Love it! The right decision! I love anything that makes a home unique and this is a wonderful 'statement!' I vote yes! Map looks fabulous. My eyes were drawn to the lamps!! They are sooooooo pretty. Love them. Can you please share the source. Have a great week ahead!! The map was my choice and I LOVE it! How about you? Truly love it Sherry….I love decorating with things that are interesting and unique…and most of all with things you love!…Looks amazing! Agree with Penny — the map needs to start higher on the wall. Now as to the board and batten, I love that look too. How about doing board and batten and hanging the (framed) map over it?? ?